Trex composite lumber is a hybrid product made up of wood dust, recycled plastics and a proprietary binding agent to hold it all together. It is pressed into shapes resembling lumber, complete with faux grain. It can be cut and worked similarly to real wood and has a long lasting, color-fast finish that makes it ideal for landscape construction projects, such as walkways. Composite lumber, like Trex makes beautiful decks and walkways. Lay out the walkway you wish to construct. Start with a drawing of your yard on graph paper. Work at a scale of one inch to a foot to make it easy to locate the various elements. Include any immovable features, such as trees, flower beds, mail boxes and other landscaping. Decide where you would like your walkway to lead and draw it on the graph paper. Measure and mark the outline of the walkway in your yard, using wooden stakes driven into the ground to mark the corners. Tie mason's twine between the stakes to outline the walkway. Walk along it, and check to make sure that it is clear of all features. Check for sprinkler heads, if your yard is equipped with irrigation. Cap off affected heads, or route the walkway around them. Build the walkway in sections. A three-foot wide walkway is sufficient for most purposes. Build it in eight-foot sections, for ease of installation. Cut five pieces of treated 2x4 lumber---33 inches long---using a circular saw. Place two 8-foot pieces of treated 2x4 lumber parallel to each other and 33 inches apart. Screw the shorter pieces between the two long outside pieces, one flush with each end, one centered 24 inches from each end and one in the center. Use two three-inch treated deck screws in each end of each piece. Build as many of these frames as needed to complete the walk way. Measure and cut a section to fit wherever an eight-foot section will not work. Lay out the walkway frames in your yard. Place a six-inch square paver under each corner. Use a level to check the frame for level. Dig out under the blocks needed to get the frame leveled. Attach the frames end to end, once all frames are on blocks and leveled. Use three-inch treated deck screws to make the attachment, use four screws in each end. Lay Trex boards on top of the frame, parallel to the long edge. 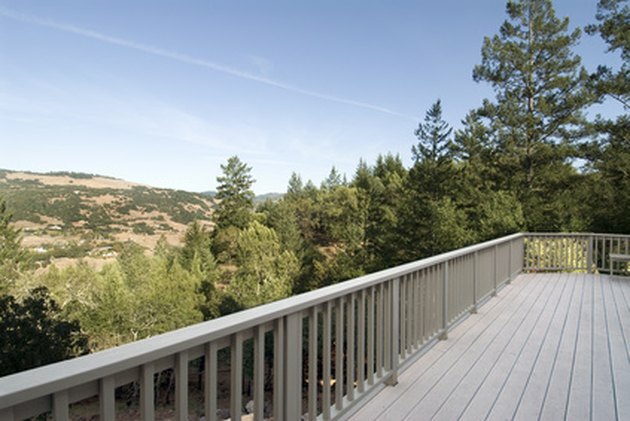 Use 10-foot long, 5/4x6 decking (the standard size for Trex decking boards) . Attach the Trex to the frame using one 5/8-inch treated deck screw, two in each joint, between a horizontal 2x4 and the Trex board. Start the second row with a piece cut to 64 inches. Stagger the lengths, starting every other row, with a piece cut to 64 inches for a stronger walkway. Space 3/16 of an inch between boards. Use the thickness of a rafter square as a spacer. Add boards to each row, butting the ends of the boards up to the previously installed boards. Make all joints between deck boards centered on top of a 2x4 for proper support. Continue adding boards until the walkway is covered. Measure and cut pieces to fit when you reach the end of the walkway. A 36-inch wide walkway will consist of six rows of Trex.